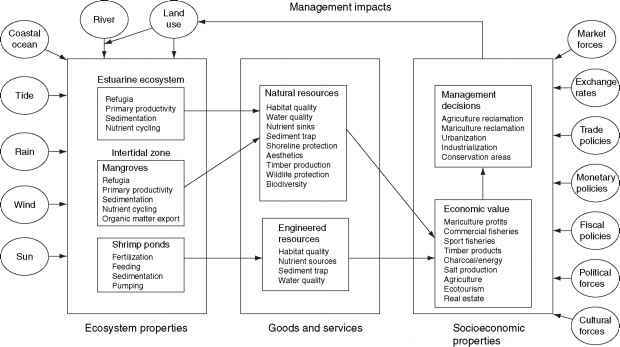 Figure 4 Conceptual framework constraints of environmental setting and human activities on ecosystem properties, ecological functions, and uses of mangrove ecosystems that determine management decisions in coastal environments. From Twilley RR, Gottfried RR, Rivera-Monroy VH, Armijos MM, and Bodero A (1998) An approach and preliminary model of integrating ecological and economic constraints of environmental quality in the Guayas River estuary, Ecuador. 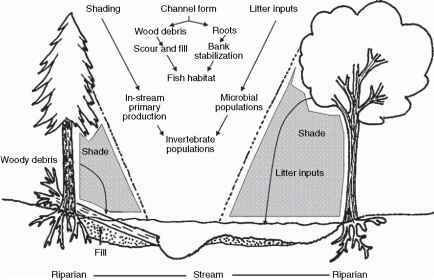 Environmental Science and Policy 1: 271-288.
regions, as well as river-basin development. Cultural constraints are complex and determine the degree of environmental management and natural resource utilization. However, the sustainable utilization of coastal resources, to a large degree, is controlled by these two social conditions of a region. Human use and value of mangrove wetlands are therefore a combination of both the ecological properties of these coastal ecosystems together with patterns of social exploitation. Therefore, any best management plan designed to provide for the sustainable utilization of mangrove wetlands has to consider both the ecological and social constraints of the region. Humans are part of all ecosystems, and management of natural resources is a combination of policies that seek to regulate the actions of societies within limitations that are imposed by the environment. Recent emphasis has been placed on comprehensive ecosystem restoration programs that represent changes in management of landscapes to reduce impacts on natural processes that enhance system recovery. There have been several reviews of mangrove restoration, which collectively have alluded to the concept that since these forested wetlands are adapted to stressed environments, they are relatively amenable to restoration efforts. The success of mangrove restoration is the establishment ofthe proper environmental settings that control the characteristic structure and function of mangrove wetlands. The goal of ecological restoration is to return a degraded mangrove site back to either the natural condition (restoration) or to some other new condition (rehabilitation). The rates of change in the ecological characteristics of mangrove wetlands between natural, degraded, and some rehabilitated condition will depend on the type of environmental impact, the magnitude of the impact, and the ecogeomorphic type of mangrove wetland that is impacted. The success of any mangrove restoration project depends on the establishment of proper site conditions (geophysical processes and geo-morphic features) along with ecological processes of the site such as the availability of propagules and the recruitment of these individuals to sapling stage of development. Some of the key parameters of a restoration project include the elevation of the landscape to provide the proper hydrology of the site, recognizing the significance of natural processes to sustaining the restored condition, and proper planting techniques to enhance recruitment. Several models of different properties of mangroves have been developed during the last decade to help facilitate planning and design of mangrove restoration projects and improve our management of these critical features of coastal landscape.